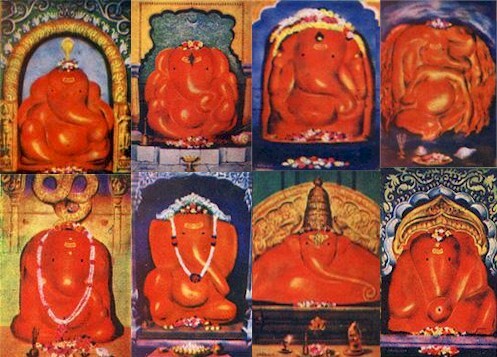 Moregaon is a village located at a distance of about 50 km from Pune, enroute to Aurangabad in Maharashtra, and it houses a shrine to Mayureshwar Vinayak. Moregaon Mayureshwar is considered to be one of the Ashta Vinayak shrines of Maharashtra, celebrating eight instances of legends related to Ganesha. The name Moresh or Moregaon arises from the fact that this region once abounded in peacocks. The name Mayureshwar also arises from the legend that Vinayak rode a peacock mount in a battle against evil demons. Legend has it that a demon by name caused untold hardship to the inhabitants of the Universe, and that responding to the pleas of the Gods, Ganapati came down to the earth on a peacock mount, waged a battle against Sindhu and vanquished him. The peacock rider Ganapati assumed the name Mayureshwar or Moresh. The original image of Ganesha made of precious metal was installed by the creator Bhrahma. The Pandava princes are said to have installed a copper image, when they visited Moregaon in the course of their pilgrimage. The Temple: An east facing image of Ganesha flanked by brass images of his consorts Siddhi and Riddhi is enshrined in this temple. Ganesha is depicted armed with a spear, while a cobra encircles his head. Interestingly, the peacock mount, the cobra and the spear (Vel) are all considered to be attributes of Kartikeya (his brother). The temple is a well visited one, fortified with lofty walls. Festivals: As with all other Vinayak temples, Ganesha Chaturti is celebrated in great splendor here. Vijaya Dasami is celebrated commemorating Ganesha's victory against the demons.